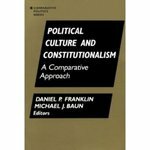 "Political Culture and Constitutionalism" by Daniel P. Franklin, Michael Baun et al. Marcie J. Patton is a contributing author, “Constitutionalism and Political Culture in Turkey” pp. 138-158. Book description: This work is a cross-national examination of the relationship between political culture and constitutionalism in the nation state. Ten countries are studied: Nigeria, Turkey, Egypt, Great Britain, Germany, Japan, India, Mexico, Canada, and the United States. In addition to the editors, the authors are Rotimi Suberu(Nigeria), Marci Patton(Turkey), Nathan J. Brown and Roni Amit(Egypt), William B. Gwyn(Great Britain), John O. Haley(Japan), Sankaran Krishna(India), Howard J. Wiarda(Mexico), and Gregory Mahler(Canada). Questions to be explored include whether constitutions can be imposed from the top or must evolve; whether constitutionalism is only a western concept; and what the relationship is between colonialism and constitutionalism. -- Publisher description. Patton, Marcie J. (1995). “Constitutionalism and Political Culture in Turkey.” Political Culture and Constitutionalism. Eds. Daniel P. Franklin and Michael Baun. NY: M.E. Sharpe (1995): 138-158. Franklin, Daniel P.; Baun, Michael; and Patton, Marcie J., "Political Culture and Constitutionalism" (1995). Politics Faculty Book and Media Gallery. 22.